Who created ‘head cheese’ and why? I realize that they try to sell everything so nothing goes to waste, but why would someone think, “Hey, I know! Let’s make really gross lunch meat out of the head and sell it?” The amazing thing is that people BUY IT! I think they just throw the word cheese in because unless you’re lactose intolerant or a vegan, who doesn’t love cheese? There is actually no cheese in it at all. They add (gag) gelatin to hold it together. Who started this crazy cold cut? Europeans. Somehow it caught on here. You might as well just call it head loaf. That’s really what it is. Head loaf. Gross. I’m actually beginning to feel nauseated right now. By the way, if you would like to make your own, here is a recipe. I know! I don’t know a single sole that admits eating this junk. Not one. Somebody is lying because it sells. Gross people eat gross food. I’m probably considered gross because I love escargot and oysters on the half shell, normally not big crowd pleasers. I love ’em. I think most of us like some weird foods. How about you? That’s disgusting! 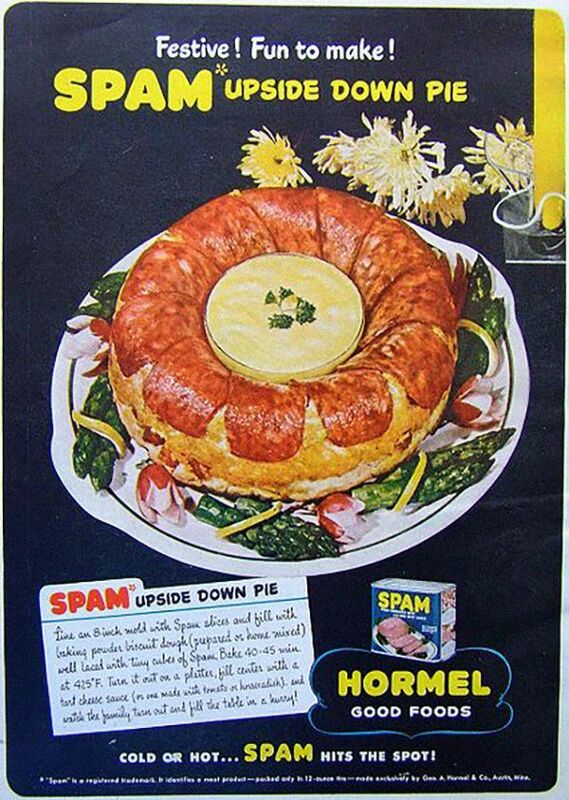 That ham concoction belongs back in mid century advertising where it belongs! Is my love for Italian salami with cream cheese sandwiches weird? lol Try it! It’s tasty. Salami with cream cheese? I’m in! I love all of the shellfish but discovered the hard way that I’m allergic. Spam? Yuk. I believe it is an acronym for squirrel, possum and mice. LOL at the Acronym! I love spam and eggs once in a while. The Salami sandwich tastes great with the Boars Head Italian cold cut salami. 🙂 But then again, I haven’t tried others with it so it may work just as well.